Extradition proceedings against Algerian pilot Lofti Raissi - once described by U.S. authorities as a trainer for the Sept. 11 terrorist attacks - were dropped Wednesday after a judge ruled there was insufficient evidence. After a day-long hearing at Bow Street Magistrate's Court in London, Judge Kim Workman ruled there was insufficient evidence to extradite Raissi to the United States on charges he lied to the Federal Aviation Administration when seeking to extend his U.S. pilot's license in April 2001. Workman also said the U.S. authorities had provided no evidence to link Raissi with terrorism. "He has appeared before me on several occasions where allegations of involvement with terrorism were made," Workman told the court. "I would like to make it clear that I have received and the court has received no evidence to support such a contention." No further extradition proceedings were planned against Raissi. His family, in the courtroom, cheered and Raissi hugged several of his relatives on hearing the news. However, James Lewis, prosecuting on behalf of U.S. authorities, told the court that Raissi "continues to be the subject of an ongoing investigation into those responsible for the Sept. 11 attacks. That is a separate matter." 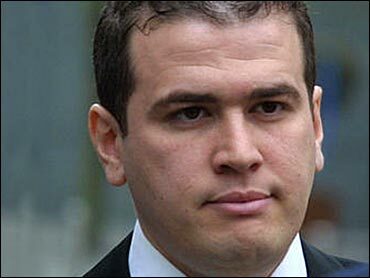 In February, Raissi was granted bail by the high-security Belmarsh court in London. He had to $14,280 bail and live at a set address. He also had to surrender his passport and was barred from applying for travel visas. Raissi, who denies any involvement in terrorism, was arrested at his home near Heathrow Airport on Sept. 21 and has been held at London's high-security Belmarsh Prison ever since. Prosecutors said in previous hearings that Raissi was suspected of training the hijackers who crashed American Airlines Flight 77 into the Pentagon. Raissi's lawyers said prosecutors had failed to present evidence to back up their claim that Raissi had links to Hani Hanjour, the pilot suspected of taking control of Flight 77. Raissi's lawyer Hugo Keith argued in an earlier hearing that the continued detention of his client would be an "affront to justice." Raissi has been indicted by a federal grand jury in Arizona on charges of falsifying applications for a pilot's license and other documents. He allegedly hid a 1993 theft conviction and failed to mention that he'd had a knee operation. He also has been indicted in Arizona on 11 more counts, including conspiracy to submit a false immigration claim.